Pet Lover Hannah Okel’s Birthday Wishes Came True! Remember that adorable dog lover and 10-year-old-to-be we introduced you to a few weeks back, Hannah Okel? The one who was determined to forgo her birthday gifts for a chance to donate to the Bow Wow Buddies Foundation? Well, she most definitely succeeded, and got a few other surprises along the way! On February 18, when Hannah arrived to deliver the remainder of her donations to Camp Bow Wow Waukesha on her 10th birthday, there were more than just a handful of happy pups waiting to greet her. Camp manager, Kari and Hannah’s mother Monica had arranged for a surprise birthday celebration to commemorate both Hannah’s birthday and her remarkable efforts to help pets in need. “It’s amazing seeing a 10-year-old want to do these things on her own. She wasn’t prompted to do anything, so all of this is her selfless act wanting to help animals who aren’t able to speak up for themselves,” said Leah Boshart, Camp Director at Camp Bow Wow Waukesha. 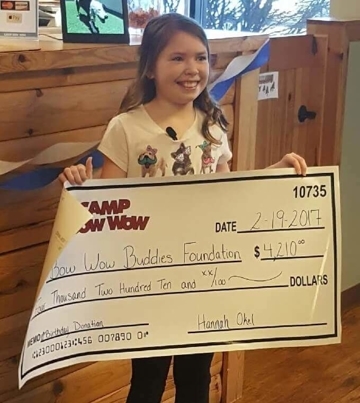 In total, Hannah was able to raise more than $2,000, bringing her grand total to around $4,500 after Camp Bow Wow Waukesha matched her fundraising efforts. On top of having the honor of presenting the Bow Wow Buddies Foundation with a “big” check, she was also honored with a veterinary lab coat, a stethoscope and her “Vet for a Day” certificate. At Camp Bow Wow, we believe in the power of the Bow Wow Buddies Foundation, and are thrilled to know there are aspiring veterinarians and animal lovers like Hannah out there who believe in it, too! And remember, just because Hannah’s fundraiser has ended, doesn’t mean you can’t still donate to the Bow Wow Buddies Foundation. There are plenty of pups out there that still need our help! Lend a paw and donate today to help dogs like Logan, Zeke, and Diesel get a second chance! Want to learn more about Hannah and her heroic fundraising efforts? Take a peek at the recent news stories featured on ABC Milwaukee and NBC Milwaukee.